« Mary Joy USA To Host Gala Fundraiser at Long View Gallery in D.C.
London (TADIAS) – Tirunesh Dibaba of Ethiopia will run the first round of the 5000 meters at the 2012 Olympics on Tuesday just four days after defending her Beijing Olympic 10,000m crown in spectacular fashion in London. The Ethiopian athletic federation needed little persuasion. “She will run, 100%,” said the organization’s technical director, Dube Jilo. The first woman to win the two events at one Olympiad when she accomplished the feat in 2008, Dibaba had been entered in the shorter event in London as a reserve, due to her having the fourth-fastest time for the distance this year among her compatriots. But with the federation also observing the fitness of the selected athletes during training, her potential double attempt had been anticipated. Jilo praised the dominant fashion of her 10,000 victory. “To come from having being out with injury for two whole years and achieve this is a great accomplishment for her, and for us and for our country,” he said. Dibaba returned to competition on New Year’s Eve after having suffered from injuries that kept her out of both the 2009 and 2011 world championships. In the interim, she successfully defended her 2008 African 10,000m title in July 2010 in Nairobi defeating, among others, the hometown favorite Linet Masai, who had won the 2009 world championships race in the absence of Dibaba, then the defending world champion. The Ethiopian had also won both distance races at the 2005 world championships. The 2009 world 5000 title went to Cheruiyot, who completed the double in Daegu in 2011, and coming into the London 10,000, the Kenyan was a favorite along with Dibaba. “I wasn’t thinking about any individual athlete, I was thinking only about winning,” said Dibaba after her second straight Olympic 10,000m victory. Prior to London, the Athens 5000m bronze medalist Dibaba had elaborated on her thoughts about Cheruiyot in an interview. “Vivian has become much stronger than in the past,” she said. The two women did not race during the Kenyan’s red-hot 2011 season due to Dibaba’s injury layoff, but the Ethiopian pointed out that she had previously run against a rising Vivian Cheruiyot — and won. “We’ve run indoors as well as outdoors,” added Dibaba, who won the Edinburgh cross country and Birmingham indoor two-mile races in early 2010, over eight seconds ahead of Cheruiyot both times. The three women will meet again in the 5000m in London, as both Cheruiyot and Kipyego are also doubling. 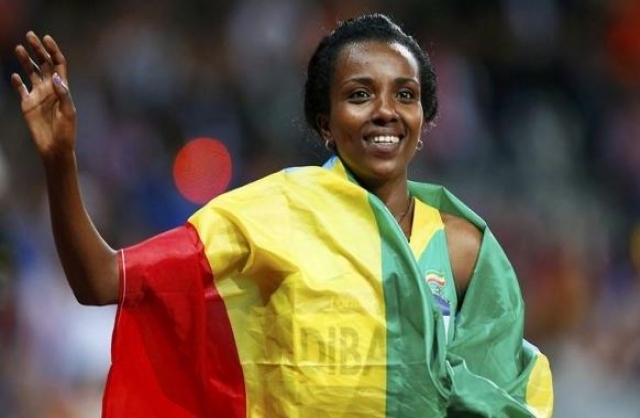 That race will also include Dibaba’s teammate and rival Meseret Defar, the 2004 Olympic champion, whom Dibaba defeated over the distance in New York in June. The Ethiopian women’s team entered in London comprised the nation’s three fastest 5000 runners of the year: Defar, former world indoor 1500 champion Gelete Burka and Genet Yalew. The event’s world record-holder Dibaba will replace the less experienced Yalew in the team. The elimination round of the women’s 5000 takes place 10:55am on Tuesday morning, with the final set for 8:05pm Friday, August 10. Sabrina Yohannes is reporting from London.